Load vehicle on Riverside Drive in front of Oso Park “loading zone” at conclusion of trip. WHEN IN DOUBT – SCOUT IT OUT! River conditions and hazards are subject to change without notice. This guide does not list all river rapids, hydraulics, holes, strainers, sweepers and other hazards. Riverbanks are slippery. Scout ahead before paddling. River Zone visitors are responsible for knowing and obeying all park rules, postings and warnings. Routine pedestrian travel is restricted to paved and rocky surfaces, except at the designated take-out trail, in order to protect endangered bird species protected by Federal and State law. Use designated entry zone to gain access to the river. Launch at POINT avoiding moss and slippery surfaces. Notes: 0.2 miles of Class 1 & 2 rapids with submerged cement sub-bank on River Right, strainers and other hazards. Portage past the Marker #9 hazard for flat-water conditions if these sections (#9 and #10) are above your skill level. Portage past hazard if this hazard is above your skill level. Launch Point “B” is an alternate put-in located under the south side of the freeway overpass if you have portaged around the Marker #9 cement hazard. Just under the southern edge of the freeway overpass (State owned property) you will find shallow, still water to launch. Take one of the rapids to River Left. Portage past the rapids if above your skill level. Take the right fork to main center channel. 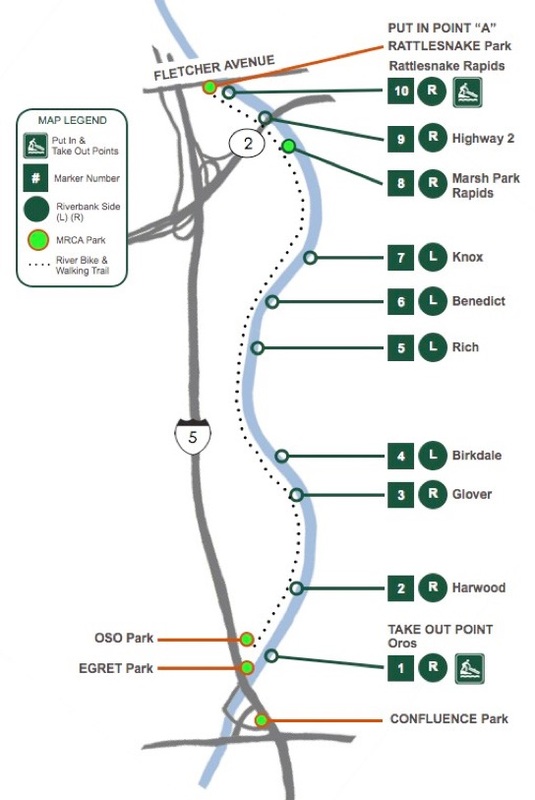 Merge to River Left from main central channel, paddle or portage chute on left. Portage past chute if above your skill level. Portage past hazard and take left fork 100 yards ahead continuing River Left. Take left fork around island, then right main fork to central channel, then to River Right. Portage past shallow cement hazard. The next 200 yards is a “jumble” of small islands and cement/ man-made hazards. Portage or carefully pick route. Take left fork to River Left. Take Out Point at sandbar beach landing to the right (100 feet). Take trail to Steelhead Park bike path using riverbank marked trail. Portage to Egret Park (26.63), then Riverside Drive to Oso Park. River partners can stay with gear at Oso Park while one member in your party takes the free shuttle back to Confluence Park parking area.